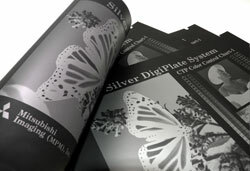 Mitsubishi Imaging is an industry leader in polyester and paper-based silver halide printing plates. 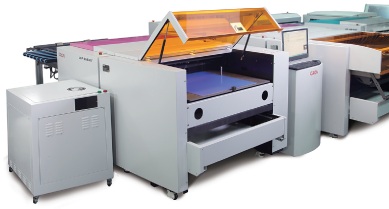 With a long history in the CTP market, our products are built to meet the needs of the small to mid-sized printer. Unlike other products that are retrofitted, our affordable solutions cost less to own and operate, are less complicated to run and allow printers to be more competitive and efficient. Polyester CTP systems perform as solid as metal CTP systems yet offer tremendous value. Customers can enjoy lower investment costs and produce quality output with less chemistry. Mitsubishi Imaging’s Silver DigiPlate™ system, which is the most widely used polyester CTP system in the market, has more than 10,000 installations worldwide and is available in both polyester and paper based plate material. Thanks to continuous R&D, Mitsubishi platesetters give small to medium sized printers the right-sized CTP for every application using significantly less chemistry than other systems. 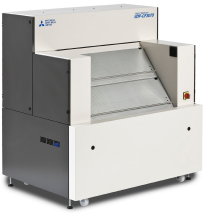 For 100% chemistry-free CTP options, Mitsubishi Imaging offers the Thermal DigiPlate (TDP) processless CTP platesetter for portrait and 2-up formats and the Violet Digiplater (VDP) CF3070 exposes up to a 6-page formats. The TDP-750, 459II or 324II dual function platesetters use a patented thermal fusing technology to create a high-contrast images on both paper-based plate or film (for screen and flexo applications) without chemical development, wash-off or ablation. The VDP-CF3070 produces high quality offset plates, 2,540 dpi, using only water in its processing with extremely low energy consumption and a minimal CO2 footprint. 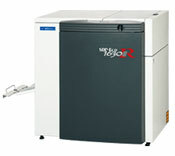 Mitsubishi’s SDP-Eco1630IIIR is a completely automated digital platesetter with lower chemistry consumption and costs. Cron-ECRM is our newest versatile metal plate CTP option that is capable of imaging resolutions up to 3600dpi and is consider more eco-friendly. Mitsubishi Imaging’s CTPs are the right choice for printers who want to work more green without sacrificing quality. Our reliable platesetters are environmentally friendly and help small and medium size commercial and newspaper printers, in-plant printers and quick printers maximize their investment and grow their business.